We were tired of paying absurdly high amounts of money to fix something as simple like an iPhone screen. The other shops in town used low-quality parts and didn't do repairs efficiently. We felt that this crack needed to be filled and thus, Houston we have a problem was born! 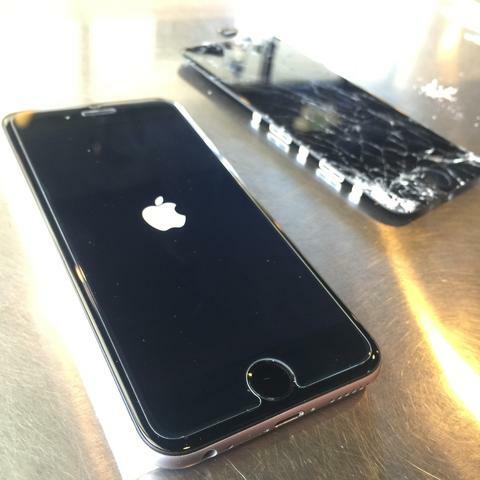 "Just got both my iPhone 6 plus screens fixed and got a couple cases such a great price and great service !! He showed me the quality of the screens and the protectors and it was top of the line!! He did the repair in front of me showed me how it's done and explained everything ! I learned new stuff. The store is very clean organized and professional. I would recommend my friends and family here! Thank you Houston for fixing my phones and giving me such a great price! Come check him out and he is the cheapest prices in town and doesn't over charge you and he actually explains whats wrong and does it in front of you. 10/10 stars!!." "I went in to Houston we have a problem as soon they opened and sure enough I was greeted with a smile. I've taken my phone to other repair shops and the people there are normally very rude. Anyways, I had gotten a quote from him a few days earlier and he stuck to it. I was super impressed with the return time and quality of the work. I also had him change the back of my iPhone and it looks great! I highly recommend this place to anybody needing quality repairs!!" "My daughter's iPhone 5S screen was cracked to the point that it was not usable. I called Houston this morning after finding him on Yelp and reading all the great comments. He was very friendly on the phone, told me to come on in, and that I didn't need an appointment. We arrived at his store at 4:45pm and he was very friendly and helpful. By 5:10pm he had completed the work and we were out the door. He guarantees his work and knows what he's doing. He replaced the screen and LED for $90 out the door. VERY IMPRESSED with him and the quality of his work. You won't be disappointed. We will go to him with all our cell repairs."